Your move to Loch na Fooey in 1978 was a complete life style change. Moving for more than just a ‘tree change’ you now have a rural life and also speak in Irish. How did this work? 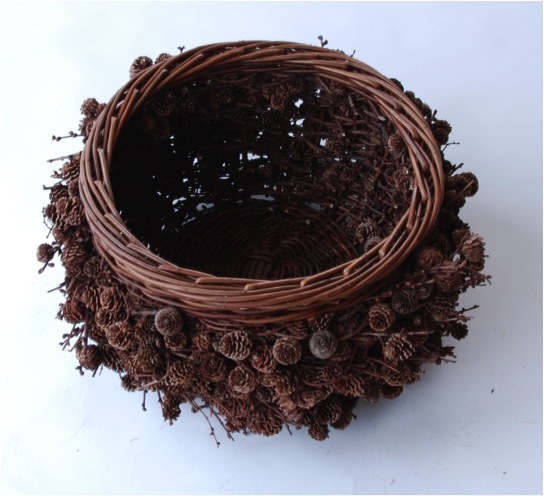 I was drawn to basket making because I wanted to grow my own willow (the raw material for baskets) and I sensed that this involvement from growing through to making would prove deeply satisfying. 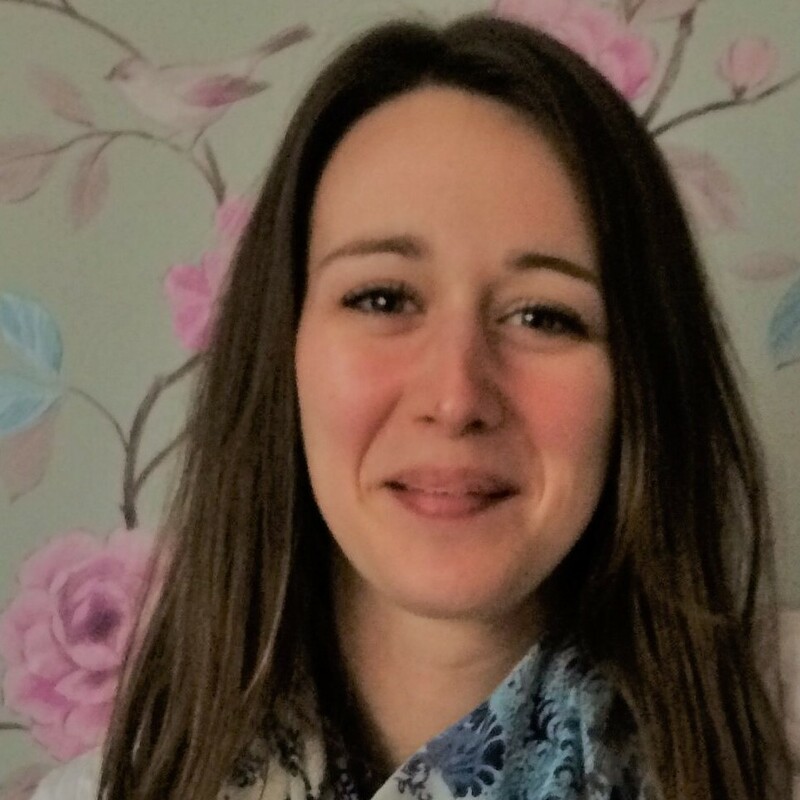 The opportunity to live rurally and develop a real understanding for a particular place was very important to my wife and myself. We wanted to farm and grow our own food and live in a beautiful environment. The area of the North West Connemara where we live is very beautiful and it is a real privilege to be able to live here. When we moved here Irish was still the first language of most of the community. My parents had spoken Irish to me when I was young so, although my Irish was rusty, it was not too difficult to begin to speak it again. It is true that it was a life style change as had both met at university so it was not the obvious choice of things to do. 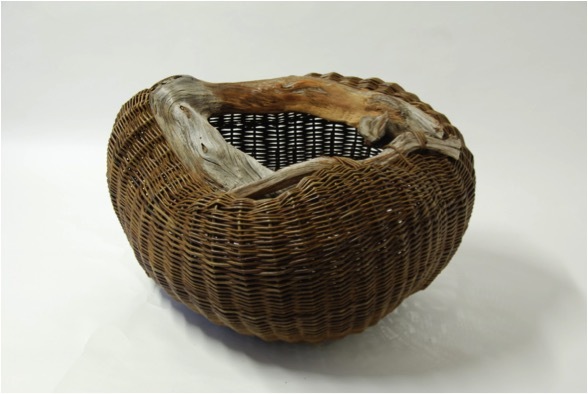 Discuss the importance of finding full-filling work and life balance, through basketry? It seems to me that to find useful and fulfilling work is one of the most important things we can do in life. Initially I used to also spend a lot of time working on our small farm but gradually I began to find basket making more and more absorbing as I became more proficient at it. We also grow a lot of our own food so with the gardening, farming and willow growing are a contrast to being inside in the workshop. How was Tommy Joyce so instrumental in the early days in Lock na Fooey? When we moved here I was able to make baskets but there was nothing particularly Irish or indeed personal about them. 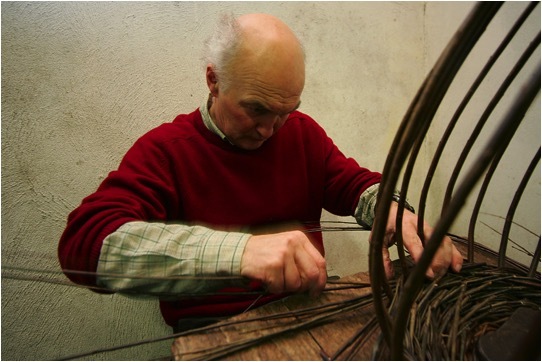 Tommy introduced me to the very rich heritage of traditional Irish baskets by showing me how to make a creel. 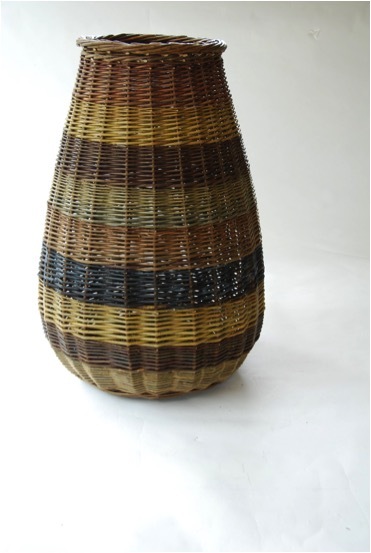 This is a type of donkey pannier which is begun at the top or mouth of the basket with the base being formed last by interweaving the uprights. This was a revelation and it still informs my work as this method of working upside down allows me to make pieces with collars of bog wood and the like. 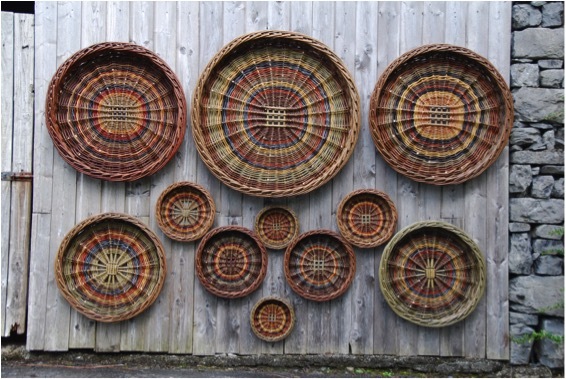 How has living close to the sea (The Atlantic) influenced your basket making e.g. lobster pots, skibs? Although the Atlantic is only about 4 miles as the crow flies it is about 8 miles by road so it has not had such a profound impact. It is true that I was able to find one of the last people making lobster pots because I lived in the right place to be aware of him. 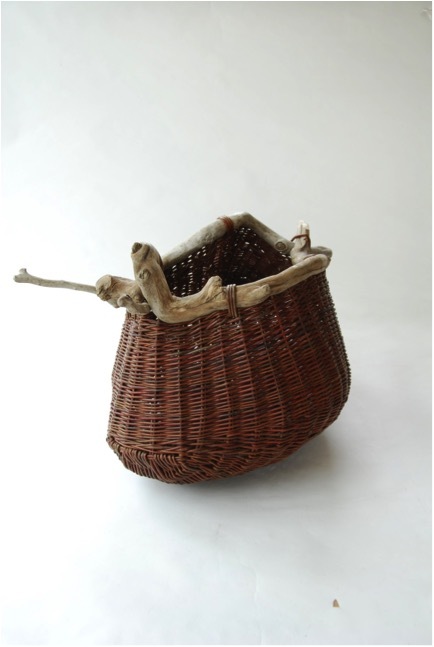 The skibs are potato baskets and as such were used inland as well as by coastal communities. My own workshop overlooks a lake and the presence of water has become hugely important to me but I cannot say whether it comes through in any way in my work. Discuss how your understanding of ecology has affected your craft? Over the past number of years I have become increasingly aware of how fragile this planet is. This has largely been the impetus for working in a more artistic manner. 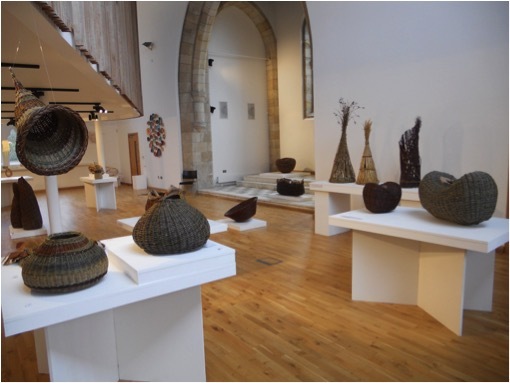 I am currently involved with six other makers- in an exhibition called “This Beloved Earth” which is currently at the Barony, West Kilbride, Scotland www.crafttownscotland.org/thebaronycentre. This exhibition encapsulates a lot of my ecological concerns and focuses on the need to look at the earth more as an organism. You use many local materials like bogwood. Can you explain how these are incorporated into your work? 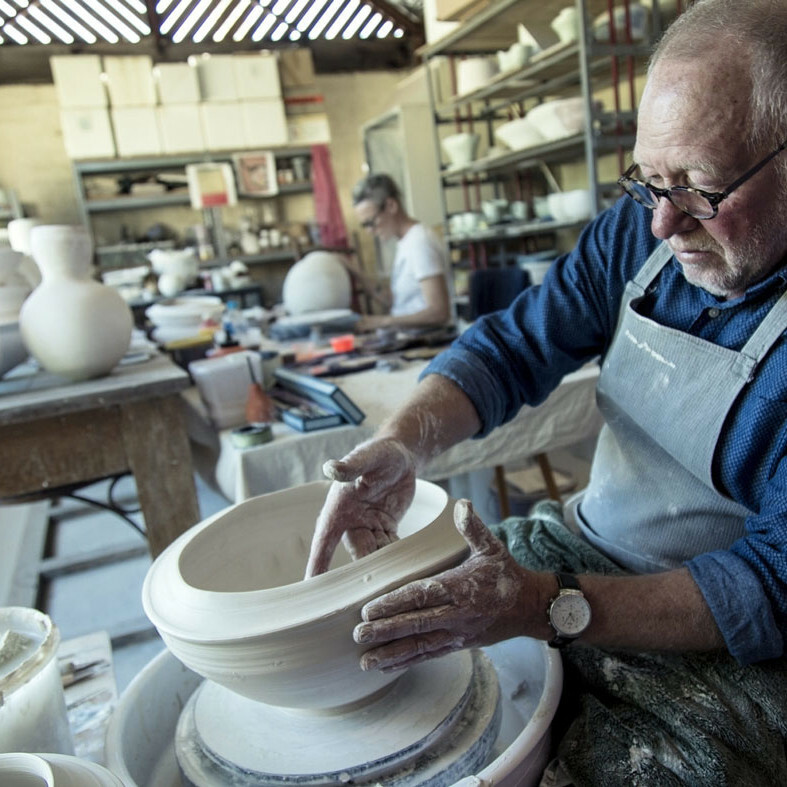 I believe the idea you are referring to has to do with a comment I made saying that my whole life is about creating; be that creating a basket or a garden, or a photograph. I see colour and desigI find the bog wood in an a nearby area of bog land where the peat has been cut away for fuel leaving the root systems of these ancient pine trees-they are more than 3000 years old- exposed. I wanted to incorporate them in my work as I find them amazing.n, and inspiration all around me. 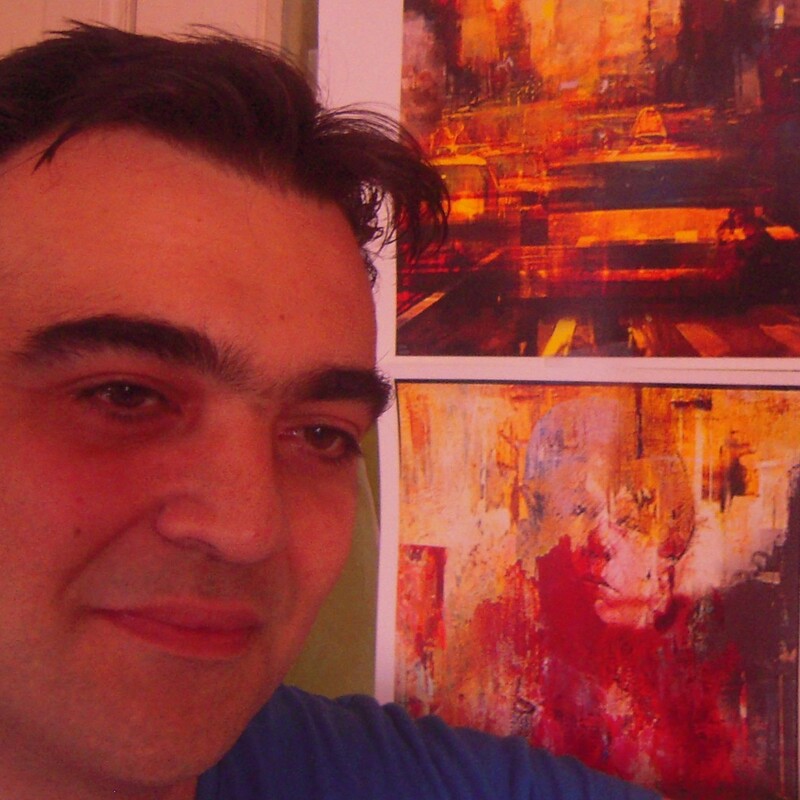 For me, creativity and inspiration are everywhere and touch every aspect of my life. 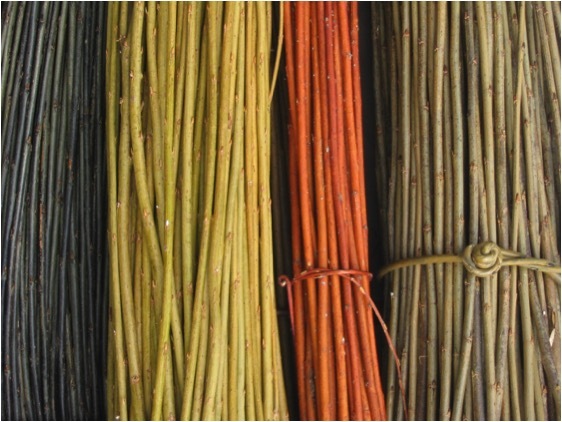 Do you only work with natural willow colours? Yes. 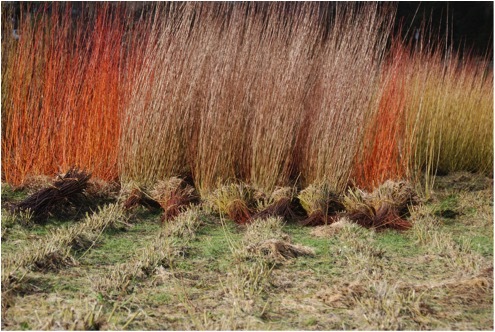 There is a very rich variety of natural colours of willow. 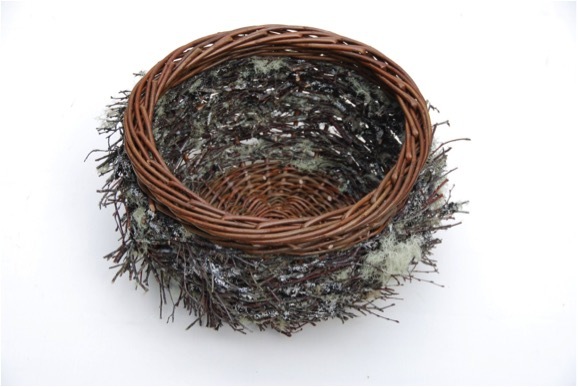 Can you explain your use of Lichen, Hazel Catkins in your work? Again it is a fascination with the material. I really like the look of it and then I see if I can weave with it. Can you explain the technique you have used in ‘Larch Bowl’? The larch twigs are harvested in winter. I look for twigs with a good number of cones on them. I planted a good few larch trees in 1978 when we first moved here so I have a fairly good choice. I almost always use a long ladder to cut the branches I want. 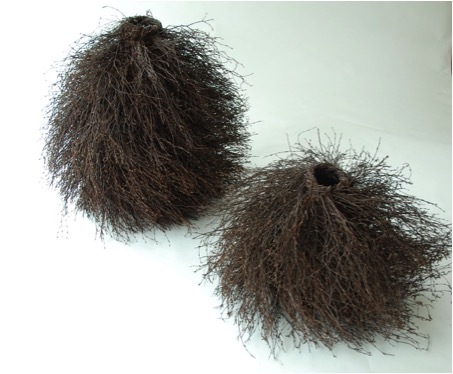 The twigs are then dried, soaked to make them flexible and steamed to increase the flexibility. Then it is a case of weaving them carefully to ensure I don’t knock the cones off in the weaving process. How small and how large are your baskets? 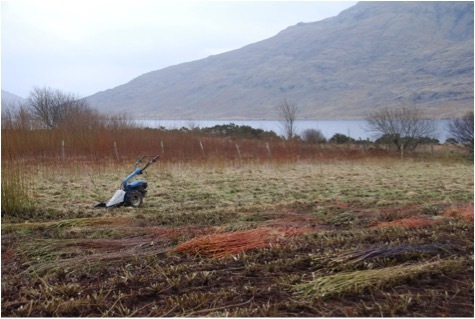 Many of the baskets using bog wood are up to a metre in length. I do try to make some smaller work as well. The bowls are about 50 cm wide. 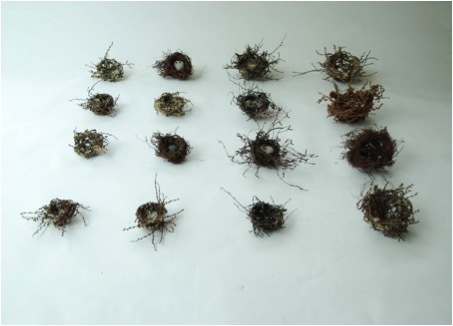 I tend not to make very small work though lately I have been making a series of nests and some of these are only 10 cm in diameter. How does poetry play a part in your craft? I find it a wonderfully rich source of inspiration. It seems to me that poetry and music can offer insights which go beyond what is purely rational or sensible towards a more intuitive view of the world. 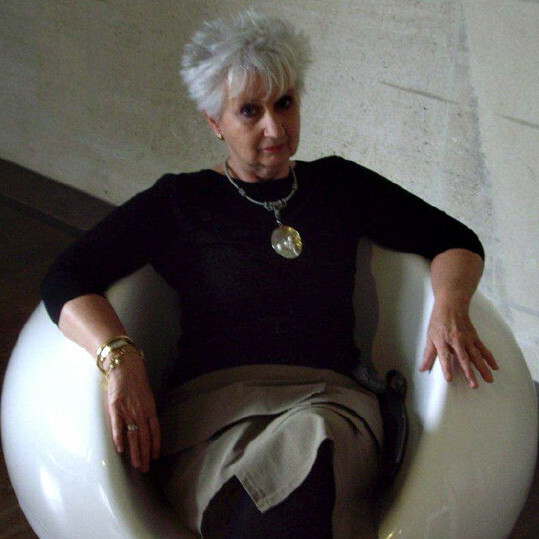 I am influenced by environmental concerns and feel that the changes we need to make as a race will become possible only when we go beyond a merely rational analysis and begin to encompass the worlds of poetry and art to imagine new – and more responsible- ways of being in the world. Can you expand on the importance of repetition in your craft? Repetition is crucial in developing crafts skills. In the case of basketmaking the techniques are relatively easy to learn but one really has to practice a lot to perfect them. I think this is true of many things in life and there is great satisfaction to be gained from making better work. 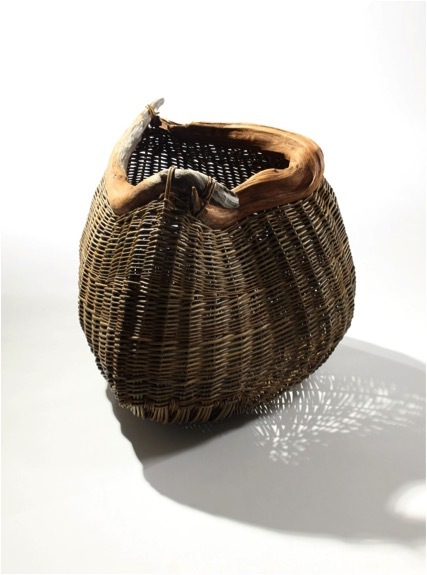 You still make traditional baskets and have expended these skills to your contemporary work, discuss? The artistic work grew out of the functional work and these baskets would not have been possible if I did not have the fluency which I developed making functional work. Even the technical solutions needed to make the bog wood baskets are informed by traditional techniques. 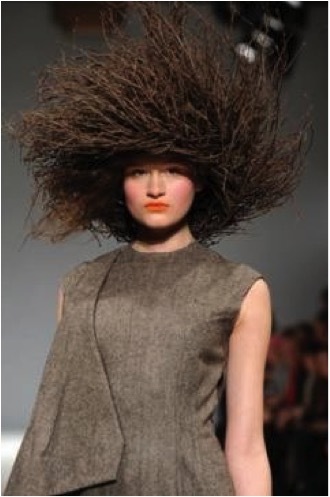 Explain about your collaboration with Joanne Haynes and her 2011 Autumn / Winter collection? Joanne was looking for something eye-catching to compliment her work and suggested a twig hat as she has seen my birch twig bowls. Once the idea was there it was not difficult to figure out a method to make it work. Your son Ciearan is also a basket maker. Do you work together? No. 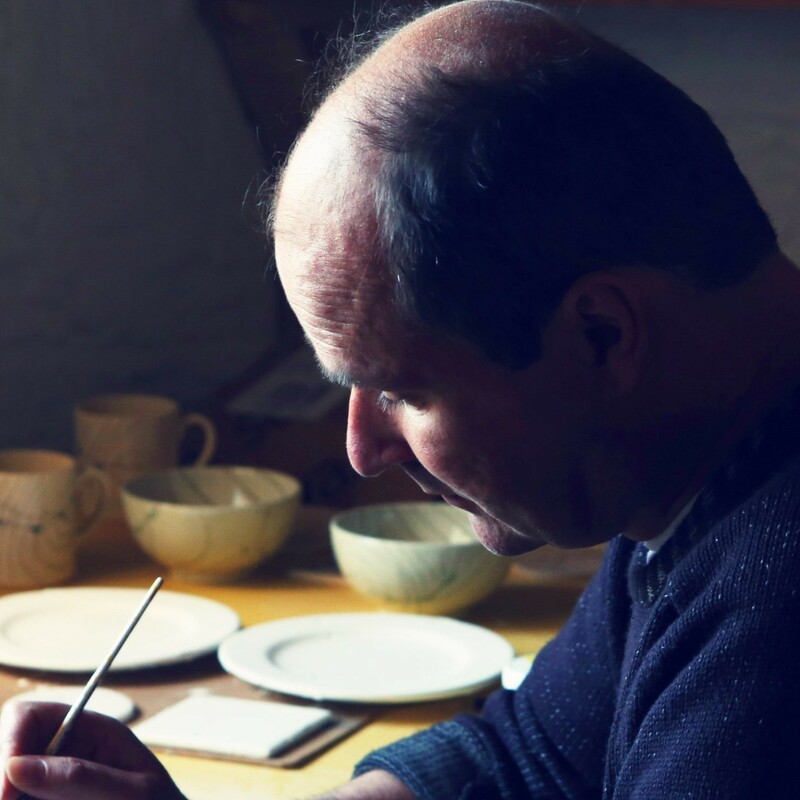 Ciaran has his own workshop in Spiddal craft centre near Galway city and he makes functional work. He did spend the best part of a year working with me a few years ago to develop his skills.